With a steady increase in demand for EPDM it has been used widely in the building and engineering trade and has now taken over the butyl for popularity. SealEco EPDM is a fish safe liner produced and manufactured in Sweden, It has been used for many years in custom made box sheets. With extra uv protection this really is a long-lasting material. During production the EPDM is vulcanised (cured under pressure and heat) creating an elastic, chemically stable product with negligible aging through exposure to UV-radiation, atmosphere, chemicals, earth, water and extremes of temperature. SealEco EPDM pond liner is black in colour. The initials EPDM are derived from its major components of Ethylene, Propylene, Diene monomer and is an M class synthetic rubber. Interestingly Butyl Rubber has EPDM in its compound to enhance certain properties. 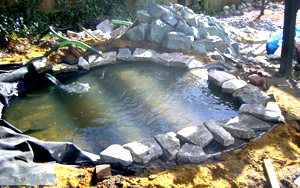 We can manufacture the pond liner sheets to your exact requirements so any size is possible to make in house, so if you want to have a fountain or water feature in your back garden or you want to cover a reservoir, we are sure we can helps. We can even come out and weld the sheets on site if required to give you a bigger area. We can also supply the underlay product to accompany your liner. This will give your liner added protection against sharp objects and will help the longevity. underlay or sand substrate is used. For use on Firestone EPDM Rubber, these tapes and adhesives are rather like a giant bicycle puncture repair kit.